My Bantam is called Peggy as a tribute to undoubtedly the best-known Bantam rider of all... Peggy Iris Thomas. Miss Thomas bought her Bantam, a rigid-framed D1, in 1950. She immediately named it Oppy after its registration number, OPE 811. 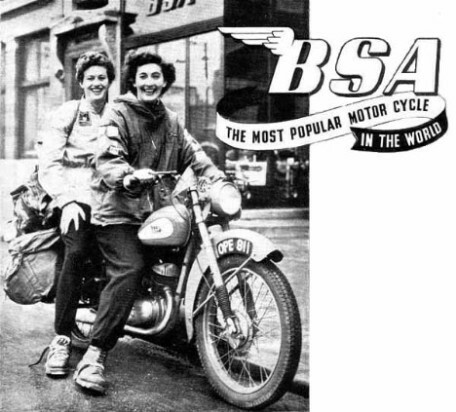 Within a few weeks she set off on a 4,500 mile tour around Scandinavia accompanied by her friend, Prudence Beggs (pictured right riding pillion). However, Peggy's most famous journey was an 18 month, 14,000 mile epic in North America. She took her 60lb Airedale dog, Matelot, along, ensconced in a makeshift box on the Bantam's parcel rack. Starting in Halifax, Nova Scotia, the pair traversed Canada to Vancouver on the Pacific coast then headed south down the West Coast of the United States. Crossing into Mexico, Peggy and Matelot travelled as far as Mexico City before heading for the Atlantic coast and taking a steamer to Florida. After an extended stay on the Florida Quays, Peggy's journey ended with a ride north to New York. Peggy carried a typewriter with her and wrote a book about the adventure called Gasoline Gypsy (later printed in the UK as A Ride in the Sun). Both titles have been long out of print and very hard to find. However, after almost 60 years, this much sought after travel classic is now back in print and can be ordered from the Gasoline Gypsy page on this website.